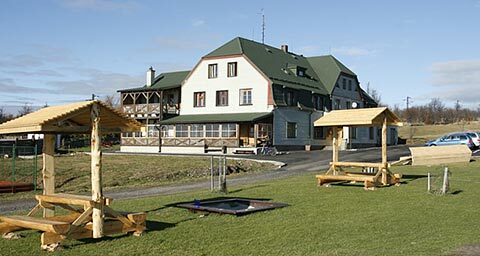 Horský hotel Lesná lies approximately 2 kms southeast of Malý Háj and 5 kms southwest of Nová Ves v Horách, directly on the mountain ridge of Krušné hory on the top of a rise bearing the same name (914 m). Nowadays the hotel offers accommodation in rooms with 2 to 5 beds with a common bathroom and toilet in the corridor. In the attic there are three suites ready for our guests. 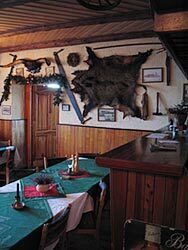 On the ground floor of the chalet you can find a bar with a restaurant open 7 days a week with separate sections for smokers and non-smokers. In the summer months an enclosed outdoor terrace is available (a resting place for cyclists for about 40 people). Next to the hotel you can find a sheltered sitting place with a fireplace where you can roast piglets, turkeys etc. upon a previous order. The hotel and its surroundings offer several sports activities for the hotel guests. Let us mention, for example, the new tennis court which is right next to the hotel. For more information see the section „WHAT WE OFFER“.